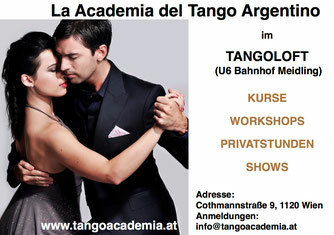 Everyone can learn how to dance tango: no matter how old you are, no previous dance experience of any kind is required. The only requirements are: joy and the willingness to learn something new! You can sign up for our courses and workshops even if you don’t have a partner. We will help you find one. Shoes: the ideal solution is without a doubt “real” tango shoes (you can find just the pair for you in our studio). If, however, you’re not sure whether or not you’ll like tango, we recommend shoes with leather soles, and heels for women. It should be possible to pivot and turn, in order for instance to perform ochos. What you can expect from our courses: we teach the traditional Tango Salon style, which you will be able to deploy in the traditional milongas (dance events) in Buenos Aires. Our courses build on each other and are holistic. That means you will learn the fundamental technique right from the start (posture, embrace, weight changes, the walk, ochos, musicality, the lead / following, improvisation) together with simple, easily usable step sequences. Change of partner: in our courses we encourage students to regularly switch partners, but this is entirely voluntary. What is a practica: “práctica” comes from the Spanish verb “practicar”: “to practice”. Prácticas are essentially time periods allotted to free practice. Here you can check the Práctica times. What is a milonga: a milonga is a formal dance event during which one can put to good use what one has learned, and have fun doing it! 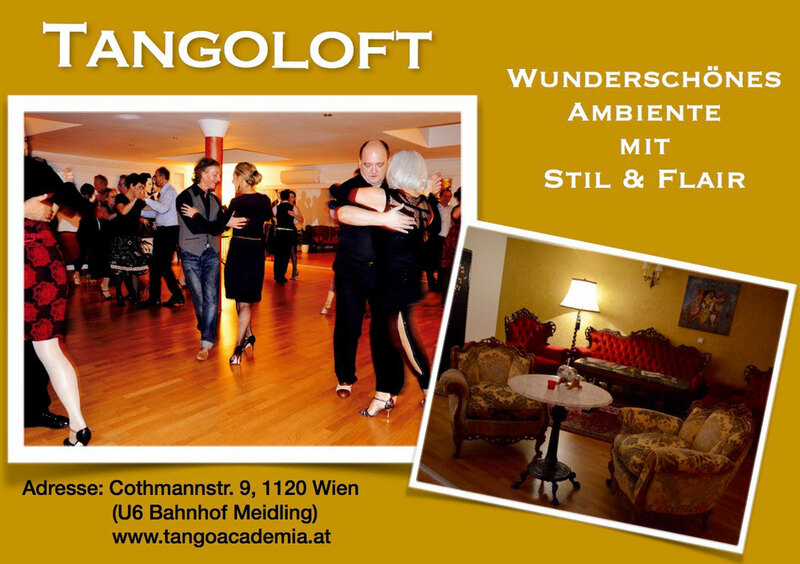 Participants dance not just to tango music but also to milonga music and tango waltzes. Milongas are normally divided musically into “Tandas” (sequences) and “Cortinas” (brief interruptions): one usually dances a sequence of 4 tangos and sits back down during the Cortina. Dancers can invite each other by making eye contact, the so-called “Cabeceo”. Milongas take place all over the world. We organize milongas in the Tangoloft 2-3 times a month, on Saturdays. About Maria and Pablo: we are professional tango dancers and highly engaged teachers. 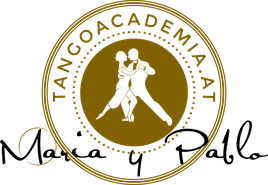 We train repeatedly throughout the year in both Europe and Buenos Aires with the best and most renowned tango dancers in the world. 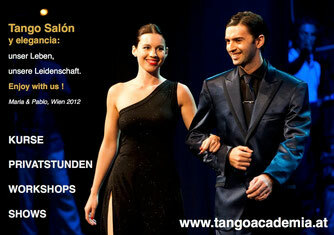 In 2012 we achieved a remarkable 6th place in the Tango Salon European Championship. Link to the ORF report. We offer an effective system: instead of a course for complete beginners, we recommend our intensive-workshops (Module 1-3) and additionally private lessons. In this way, you will be able to get into the feeling of argentine tango faster and see your first results quicker. After learning the most important basics, you can continue with the fundamentals II courses (Mon. + Wed.). We look forward to seeing you in our studio soon!